The current study investigated the efficacy of two brief intervention programs—biofeedback and mindfulness meditation—on levels of state anxiety and perceived stress in second-year Thai nursing students as they began clinical training. Dr. P. Ratanasiripong is Professor of Counseling, and Ms. Park is a recent graduate of the Marriage and Family Therapy Program, California State University, Long Beach, and Dr. N. Ratanasiripong is Assistant Professor of Nursing, California State University, Dominguez Hills, California; and Dr. Kathalae is Lecturer, Boromarajonani College of Nursing, Nakhornrat-chasima, Thailand. Address correspondence to Paul Ratanasiripong, PhD, Professor of Counseling, California State University, 1250 Bellflower Boulevard, Long Beach, CA 90840; e-mail: Paul.Ratanasiripong@csulb.edu. Among nursing students, significant levels of emotional distress have been exhibited (Jones & Johnston, 1997; Tully, 2004). Myriad stressors exist in nursing students’ experiences, including meeting professional and academic demands, fear of failure, taking care of patients, and insecurity regarding clinical competence or lack of knowledge (Chan, So, & Fong, 2009; Chernomas & Shapiro, 2013; Jones & Johnston, 1997; Rhead, 1995; Suresh, Matthews, & Coyne, 2013). Consequently, stress and anxiety can affect academic and clinical performance, health, and well-being (Cheung & Au, 2011; Gibbons, Dempster, & Moutray, 2011; Jimenez, Navia-Osorio, & Diaz, 2010; Klainin-Yobas et al., 2014). Anxiety and stress can be especially high during times of clinical training as students develop their clinical skills (Admi, 1997; Jones & Johnston, 1997; Moscaritolo, 2009). Stress and anxiety is notably woven into the nursing students’ educational experience internationally (Chan et al., 2009; Jimenez et al., 2010; Kang, Choi, & Ryu, 2009; Klainin-Yobas et al., 2014; Nolan & Ryan, 2008; Tully, 2004). The population of interest for the current study—Thai nursing students—appears to be no exception, as high levels of stress have been linked to poorer health and depression (Klainin-Yobas et al., 2014; Ross et al., 2005). It is imperative to address these high levels of distress in nursing students, as they can have an effect on performance and well-being. Lazarus and Folkman (1984) asserted that a psychological experience of stress results when a situation is perceived to be harmful or exceeding one’s resources. Anxiety can be seen as relatively related to stress, in that it can be aggravated by the presence of prolonged stress and multiple stressors. Anxiety is a state of apprehension and an out-of-proportion response to a perceived threat, which can disrupt psychological functioning and manifest as physiological symptoms, such as elevated blood pressure, sweating, dizziness, or increased heartbeat (Editors of the American Heritage Dictionaries, 2007; Lewis, 1970). Previous studies of stress and anxiety management programs for nursing students have used a combination of interventions, such as problem-solving strategies, cognitive reappraisal, and meditation or relaxation skills, which have been effective in differing forms (Beddoe & Murphy, 2004; Galbraith & Brown, 2011; Godbey & Courage, 1994; Jones & Johnston, 2000; Sharif & Armitage, 2004; Yazdani, Rezaei, & Pahlavanzadeh, 2010). However, further research on other interventions would be beneficial. Particularly in the college environment, schools can experience budget cuts and limited resources to utilize more costly interventions, including psychotherapy and drugs (Henriques, Keffer, Abrahamson, & Horst, 2011; Ratanasiripong, Sverduk, Hayashino, & Prince, 2010). Developing interventions that are low cost and easily implemented may be valuable in educational environments with resource constraints. One method that has been investigated to reduce stress and anxiety is mindfulness meditation (synonymous with mindful meditation). Mindfulness meditation is derived from Vipassana meditation in Buddhism, which is defined as a process of focusing one’s mind in the present moment, maintaining a nonjudgmental attitude, and detaching from destructive thoughts and feelings (Dryden & Still, 2006). In the Buddhist tradition, the concept of the self is impermanent and considered harmful by producing thoughts of selfishness, attachment, and suffering (Germer, 2013; Rahula, 1959). Thus, mindfulness meditation is a means of sensory detachment and reducing bias in one’s perception of the world (Tyson & Pongruengphant, 2007). Variants of mindfulness meditation have been incorporated into Western psychology and have shown evidence of improving mental health (Goyal et al., 2014). For example, mindfulness-based stress reduction (MBSR) programs have been effective in alleviating depression, anxiety, and chronic pain (Kabat-Zinn, 1982; Kabat-Zinn et al., 1992; Ramel, Goldin, Carmona, & McQuaid, 2004; Vøllestad, Sivertsen, & Nielsen, 2011; Wong et al., 2011). MBSR can also decrease stress, increase the quality of life and compassion, and reduce burn-out and improve the health of health care professionals (Foureur, Besley, Burton, Yu, & Crisp, 2013; Mackenzie, Poulin, & Seidman-Carlson, 2006; Shapiro, Astin, Bishop, & Cordova, 2005). Although MBSR has been shown to reduce psychological symptoms and foster greater empathy and compassion in nursing students (Beddoe & Murphy, 2004; Song & Lindquist, 2015), outside of the MBSR framework, studies of mindfulness meditation as a practice alone or as a brief program are limited. Although there are promising results for one brief mindfulness meditation program in reducing anxiety (Chen, Yang, Wang, & Zhang, 2013), more research is needed to support mindfulness meditation as a stress and anxiety reduction practice for nursing students. Biofeedback is a noninvasive intervention that has been used since the 1960s in which an individual receives information on his or her various physiological responses from a mechanical device and learns to actively modify them by controlling his or her internal processes (Ratanasiripong et al., 2010). Biofeedback training can modify anxiety or stress symptoms by reducing maladaptive psychophysiological arousal (Green, Green, & Walters, 1974; Ratanasiripong et al., 2010). Biofeedback can include electroencephalography, electromyography, galvanic skin response, skin temperature, and heart rate (Heaman, 1995; Ratanasiripong et al., 2010). With nursing students, studies have shown that biofeedback is effective in reducing state anxiety, test anxiety, and tension (Heaman, 1995; Prato & Yucha, 2013; Utz, 1994). More recently, heart rate variability (HRV) biofeedback has been explored. HRV is the beat-to-beat variations in heart rate and is measured by a noninvasive device. Although other biofeedback programs can be costly, HRV biofeedback devices are portable and low cost (Ratanasiripong et al., 2010). The existing literature has produced positive results on HRV biofeedback to reduce anxiety, posttraumatic stress, and depression (Ratanasiripong, Sverduk, Prince, & Hayashino, 2012; Siepmann, Aykac, Unterdörfer, Petrowski, & Mueck-Weymann, 2008; Tan, Dao, Farmer, Sutherland, & Gevirtz, 2011). In one study, Ratanasiripong, Ratanasiripong, and Kathalae (2012) found that HRV biofeedback decreased anxiety while maintaining stress levels in nursing students beginning clinical practice. Although research is limited on HRV biofeedback in the nursing student population, further study could help to establish the intervention as a possible means to manage stress and anxiety. The purpose of this study was to investigate the impact of two intervention programs—biofeedback and mindfulness meditation—on levels of anxiety and stress in second-year Thai nursing students beginning clinical training. To date, no studies exist that compare the efficacy of the two interventions in nursing students. The intent of the current study was to provide nursing students with coping interventions, as well as to present nurse educators with intervention programs and coping suggestions to offer to students who are struggling with stress and anxiety related to their academic and clinical experiences. Participants were recruited from a public nursing college in Thailand. Ninety second-year nursing students were invited to participate, and a total of 89 students participated in this study. Due to the low number of male nursing students enrolled in the program, only female students were recruited. Participants’ ages ranged from 18 to 21 years (M = 19.27, SD = 0.56). Grade point average ranged from 2.58 to 3.95 (M = 3.12, SD = 0.28). All participants read the informed consent and voluntarily agreed to participate. Based on a priori power analysis by G*Power, 66 participants were needed for this study (Faul, Erdfelder, Buchner, & Lang, 2009). Using the parameters of alpha = 0.05, effect size = 0.40, and power = 0.80, the sample size needed per group for analysis of variance (ANOVA) was 22 participants. Participants were randomly assigned to one of three groups: the biofeedback group (n = 29), the mindfulness meditation group (n = 29), or the control group (n = 31). Institutional review board approval from the local nursing college was obtained. Participants completed preintervention and postintervention surveys, which included demographic information, the Perceived Stress Scale, and the State Anxiety Scale. The surveys were completed at the beginning of the school year and 4 weeks after the start of the study. At postintervention, nursing students had been seeing clinical patients for 4 weeks. The biofeedback group received two training sessions, led by two researchers of the current study (P.R., N.R. ), on how to use the biofeedback device. Participants in the mindfulness meditation group also received two trainings; however, they were taught Vipassana meditation. A meditation trainer was hired to conduct the trainings. Participants in both intervention groups were instructed to use their taught intervention three times per day for 4 weeks and to record their practice time in a log each day. The control group received no intervention. All participants were given 150 Baht (local currency equivalent to the cost of five moderate meals) for their participation in the study. Perceived Stress Scale. The Perceived Stress Scale (PSS; Cohen, Kamarck, & Mermelstein, 1983) measures the level of perceived stress in the past month. The scale has demonstrated validity in the Thai population, with significant relationships to relevant scales (Wongpakaran & Wongpakaran, 2010). The PSS has also been used reliably in past with Thai medical and nursing students (Ratanasiripong, Ratanasiripong, et al., 2012; Wongpakaran & Wongpakaran, 2010). In the current study, the Cronbach’s alpha was 0.62 for both pre- and postintervention. State Anxiety Scale. The State Anxiety Scale is from the State–Trait Anxiety Inventory and measures temporary, situational anxiety (Spielberger, Gorsuch, Lushene, Vagg, & Jacobs, 1983). The State–Trait Anxiety Inventory has demonstrated concurrent validity with college students (Roberti, Harrington, & Storch, 2006), and good reliability with Thai nursing students (Ratanasiripong, Ratanasiripong, et al., 2012). Cronbach’s alpha in the current study for the scale was 0.89 at preintervention and 0.92 at postintervention. ANOVAs were conducted for demographic and pre-test variables to ensure that homogeneity of variances assumption had been met. No significant differences were observed in the means for age, grade point average, PSS scores, and the State Anxiety Scale scores among participants in the three groups (p > 0.05). Repeated-measures ANOVAs were used to compare pre- and postintervention scores in the three groups. Results indicated that the mindfulness meditation group had a significant reduction from preintervention (M = 17.24, SD = 4.16) to postintervention (M = 14.90, SD = 3.44) scores (F[1, 28] = 13.76, p = 0.001, η2 = 0.33). Although the biofeedback group showed a decrease in PSS scores from preintervention (M = 17.17, SD = 3.30) to postintervention (M = 15.72, SD = 4.19), the reduction was not statistically significant (F[1, 28] = 3.11, p = 0.089). For the control group, PSS scores at preintervention (M = 17.29, SD = 3.50) and postintervention (M = 16.74, SD = 4.71) showed no significant differences (F[1, 30] = 0.37, p > 0.05). An ANOVA was also performed to compare the PSS scores of the three groups at postintervention, which showed no significant differences (F[2, 86] = 1.48, p > 0.05). Repeated-measures ANOVAs were conducted to compare scores of the State Anxiety Scale. A significant decrease was found in the meditation group from preintervention (M = 25.45, SD = 7.80) to postintervention (M = 21.28, SD = 6.95) in State Anxiety Scale scores (F[1, 28] = 14.36, p = 0.001, η2 = 0.34). Similarly, the mean preintervention State Anxiety Scale score (M = 22.69, SD = 8.26) reduced significantly at postintervention (M = 17.69, SD = 7.74) in the biofeedback group (F[1, 28] = 8.89, p = 0.006, η2 = 0.24. 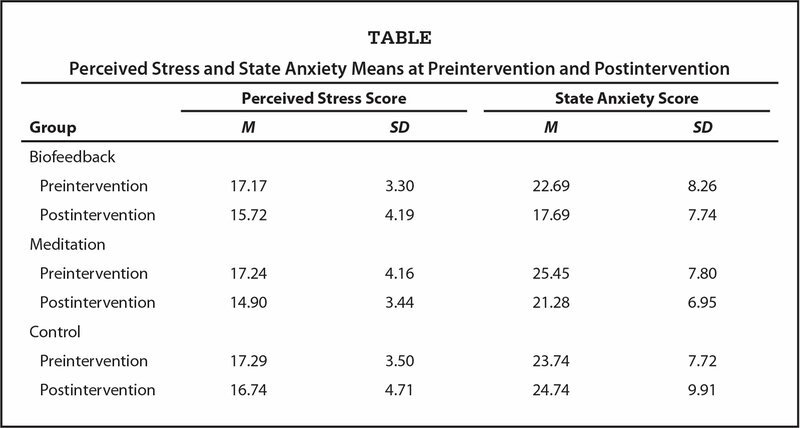 For the control group, means in State Anxiety Scale scores from preintervention (M = 23.74, SD = 7.72) to postintervention (M = 24.74, SD = 9.91) showed no significant differences (F[1, 30] = 0.38, p > 0.05). The Table presents the score comparisons. A significant interaction effect was found (F[2, 86] = 4.84, p = 0.01), indicating that decreases in anxiety levels were greater in the mindfulness meditation and biofeedback groups, compared with the control group, where there was no decrease in anxiety levels. An ANOVA also revealed significant differences in State Anxiety Scale scores at postintervention (F[2, 86] = 5.37, p = 0.006). A Scheffe post hoc test showed that the biofeedback group had significantly lower scores (M = 17.69, SD = 7.74) compared with the control group (M = 24.74, SD = 9.91) at postintervention (p = 0.002). Results indicate that biofeedback helped to reduce anxiety levels, while maintaining stress levels. Perceived stress decreased at postintervention; however, the decrease was not significant. Stress, by definition, is the degree to which a relationship between a person and the environment is perceived as overwhelming one’s resources (Lazarus & Folkman, 1984). Similarly, although the biofeedback intervention reduced students’ anxiety, the results suggest that it did not necessarily lessen the strength of their perception in viewing their educational demands as being overloading. Yet, participants who used biofeedback had significantly lower anxiety than those in the control group at postintervention, indicating that students using biofeedback fared better than those who had no intervention. The mindfulness meditation intervention program also significantly reduced anxiety levels, as well as levels of perceived stress in nursing students. These results further substantiate the use of mindfulness meditation in decreasing anxiety and stress that was established in past research, as well as to contribute evidence for the effectiveness of mindfulness meditation as an intervention with the nursing student population. The current study investigated one nursing college in one country. Further research at multiple nursing schools and schools in other countries is needed to establish the current study as replicable. Another limitation is the lack of follow-up on the long-term impact of biofeedback and mindfulness meditation interventions on stress, anxiety, and academic performance. Because nursing students experience high levels of stress and anxiety in their educational environment, it is critical for nurse educators to view students’ health as a priority and aid those who may be experiencing anxiety or stress. Educators can help students by integrating intervention programs into the educational curriculum that target management of stress and anxiety. The current study offers two possible intervention programs and supports the integration of biofeedback or mindfulness meditation into the educational curriculum. The current study found that a biofeedback intervention program could help nursing students reduce their anxiety levels, while maintaining stress levels. In addition, a mindfulness meditation program can help to decrease both anxiety and stress. These findings support the use of the two interventions as possible coping tools for students to manage stress and anxiety. Although stressors may be embedded into the nursing students’ experience, nurse educators can set up intervention programs to reduce negative mental states that result from the pressures and demands with which students grapple. Admi, H. (1997). Nursing students’ stress during the initial clinical experience. Journal of Nursing Education, 36, 323–327. Beddoe, A.E. & Murphy, S.O. (2004). Does mindfulness decrease stress and foster empathy among nursing students?Journal of Nursing Education, 43, 305–312. Editors of the American Heritage Dictionaries. (2007). The American Heritage® medical dictionary (Revised ed.). Boston, MA: Houghton Mifflin Harcourt. Germer, C.K. (2013). Mindfulness: What is it? What does it matter? In Germer, C.K., Siegel, R.D. & Fulton, P.R. (Eds. ), Mindfulness and psychotherapy (pp. 3–35). New York, NY: The Guilford Press. Heaman, D. (1995). The quieting response (QR): A modality for reduction of psychophysiologic stress in nursing students. Journal of Nursing Education, 34, 5–10. Lazarus, R.S. & Folkman, S. (1984). Stress, appraisal and coping. New York, NY: Springer. Lewis, A. (1970). The ambiguous word “anxiety.”International Journal of Psychiatry, 9, 62–79. Rahula, W. (1959). What the Buddha taught. New York, NY: Grove Press. Ratanasiripong, P., Sverduk, K., Hayashino, D. & Prince, J. (2010). Setting up the next generation biofeedback program for stress and anxiety management for college students: A simple and cost-effective approach. College Student Journal, 44, 97–100. Spielberger, C.D., Gorsuch, R.L., Lushene, R.E., Vagg, P.R. & Jacobs, G.A. (1983). Manual for the State Trait Anxiety Inventory (Form Y). Palo Alto, CA: Consulting Psychologists Press. Yazdani, M., Rezaei, S. & Pahlavanzadeh, S. (2010). The effectiveness of stress management training program on depression, anxiety and stress of the nursing students. Iranian Journal of Nursing and Midwifery Research, 15, 208–215.